Mountaineers are always free and they love to celebrate life and everything about it. From soup to nuts and everything in between, you’ll find the 10 best fall festivals in the Mountain State that are guaranteed to educate you, entertain you, and make you smile! The New River Gorge Bridge was first opened for traffic in October 1977, and shortened the route across the gorge by 45 minutes each way. This one-of-a-kind event has been celebrated each year for decades in Fayetteville, West Virginia, not just because of the travel benefits, but because it’s a magnificent example of modern technology. The bridge is just over 3,000 feet-long and the largest single arch bridge in the Western Hemisphere, never needs painting, and the drive across provides an excellent view of the stunning New River below. Activities during Bridge Day include international BASE jumpers, your choice of adventures on the gorge, a chili cookoff, live music, food sampling from local restaurants, and much more. Come celebrate the beginning of fall at the West Virginia Pumpkin Festival in Milton, West Virginia. 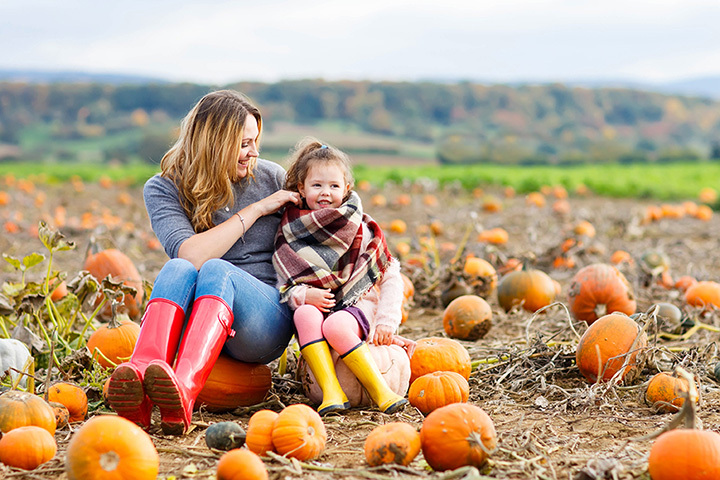 Since 1986, visitors have been enjoying the pumpkin harvest so much so that it’s become one of the state’s largest festivals. Truly a family event, the festival has events like juried craft displays, special exhibits and demonstrations of blacksmithing, pottery making, quilting, and other skills from yesteryear. Live music is a special treat and can be found in abundance. Groups rates are available and parking is free. Promoted as the state’s best festival since 1954, the Black Walnut Festival, which kicks off on the second Thursday of October in Spencer, West Virginia, commemorates the sale of two million pounds of black walnuts sold, creating the recognition that the dark meaty nut was a viable cash crop. Admission to the festival is free, and the four-day event has around 50,000 people in attendance to enjoy all things related to the black walnut. There are cooking and baking contests, food and craft booths, a parade, car show, band competition, flea market, flower show, and the crowning of the Black Walnut Festival Royal Court. The Mothman Festival is one of the most unique celebrations anywhere, and is a point of remembrance for the first sighting of the legendary Mothman, a creature who existence has not been proven, but is believed by many to have given the forewarning of the Silver Bridge collapse that killed 46 people. You’ll get to hear international speakers talk about paranormal events, take a picture with the Mothman statue in front of the museum, listen to live music, and have good clean family fun. If you’re looking for something different, this is the festival to attend. Only in the Mountain State would you find a festival dedicated to off-roading and dirt bikes. But if you love the thrill of riding up and down backroads, this unique and nationally recognized UTV, ATV, and dirt bike riding event is for you. Gilbert, West Virginia is where the event occurs and there’s something for everyone in your family from scavenger hunts and mud pit runs to wheelie contests and activities for the kids. This four-day festival also has a meal-included option. Most people don’t think of potatoes when they think of West Virginia, but potatoes have been a staple in Nicholas County for a long time. The two-day festival celebrates the earthy spud in various ways like the popular and well-attended Tater Tot Sundae & Mashed Potato-Eating Contests, spud hunt, potato decorating contest, and potato sack race. There’s live music, a parade, a 5K Walk/Run, car show, book sale, food and craft booths, and carnival rides. Smashed Pota“doe” Patties, Thumper Bumper over Grits, and Chinese Chef Boar RD Noodles are just some of the entries in previous years at the annual Road Kill Festival and Cook-off held in Marlinton, West Virginia. Admission is only $5 and allows you to experience great local bands, food, and fun. Created to celebrate the autumn harvest, this two-day festival is a lot of fun, and you can sample mountain delicacies that you won’t find anywhere else. If you’re used to seeing West Virginia’s capitol every day, come see what happens when you have local artists transform the already-beautiful city into a work of art. The 10-day FestivAll Fall Festival held each year brings together more than 80 arts and community organizations and hundreds of local, regional, national, and international artists. Most events are free and can be found indoor and outside. Take a stroll through the downtown area and appreciate the traditional Appalachian music, taking in the other sights and sounds that make West Virginia what it is. The Mountain Heritage Arts & Crafts Fall Festival is held in the beautiful rolling hills of Harpers Ferry, West Virginia, which is perfectly appropriate for admiring and appreciating the rich cultural history of Appalachia. Crafters and artisans display their wares, and live music and food vendors let you experience that side of the state’s heritage. There’s even a Sit and Sip Tent for adults over the legal drinking age to sample local wineries and breweries from around the state. West Virginia has always been a place where the simple things are appreciated and celebrated. The buckwheat harvest was the reason for the celebration that started more than 76 years ago and has become an annual festival in Kingwood, West Virginia. Festival goers can visit booths of local artists and crafters, and food is in abundance. There’s a carnival with rides for the kids, live music, and livestock showings.